Blackberry Curve 9380 dibuat dengan keadaan full touchscreen dan tidak menggunakan querty keyboard. Dengan 3.2 inchi layar penuh, Blackberry Curve 9380 tampak kelihatan elegan. The Blackberry Curve 9380 was brought to a new level with its full touchscreen display. Unlike its predecessor, this new models does not comes with QWERTY-keyboard and has a full 3.2-inch display screen. Unfortunately, it still runs with 360 x 480 pixel and the same 800MHz processor. It also has an internal storage of 512 MB storage and 512 MB RAM. 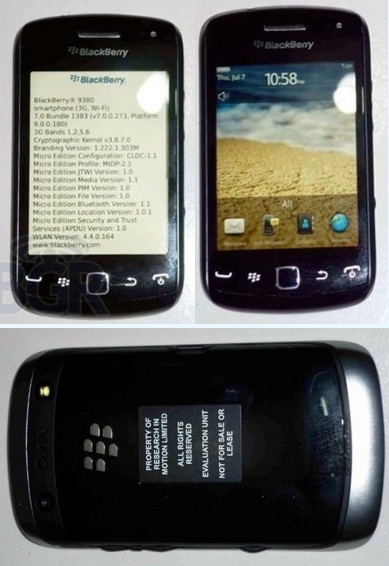 However, its full touchscreen reminds us of the Blackberry Torch. Blackberry Curve 9380 ini menggunakan OS Blackberry OS 7 dengan prosessor 806 MHz. Berikut adalah spesifikasi Blackberry Curve 9380.